Emergency Response Agencies Awards Dinner | F.F.A.M. Five of Randolph County’s fire departments came together this past Saturday evening to host a combined awards dinner. For the first time all five of the county’s fire departments that are manned by volunteers honored those same volunteers with awards for their service to the community. Over 175 people were present at the Municipal Auditorium in downtown Moberly to recognize the service to the community of 20 individuals. Each of the five fire departments, Eastern Randolph County Fire Protection District, Higbee Area Fire Protection District, Northeast R-IV Rural Fire Protection District, Southeastern Randolph County Fire Protection District and Westran Fire Protection District each recognized four individuals. The Chief’s Award was presented to Scott Anderson for the Eastern Randolph County Fire Protection District. Higbee Area Fire Protection District’s Chief’s Award was presented to Zach Kirkendoll. Al Goodger received Northeast R-IV Rural Fire Protection District’s Chief’s Award. Long-time volunteer Jim Wilson received the same award from Southeastern Randolph County Fire Protection District. John Rhodes was awarded the Chief’s Award from the Westran Fire Protection District. The Community Service Award was presented to several individuals that have been of great value to the community as a whole. The award from Southeastern Randolph County Fire Protection District was presented to the family of the late Bob Wilcox. Jim and Wanda Finnegan received the same honor from the Eastern Randolph County Fire Protection District. Higbee Fire Protection District presented their Community Service Award to Roger Ware. Nancy Bragg was awarded for her work in the community by the Northeast R-IV Rural Fire Protection District. The Westran Fire Protection District also presented a Community Service Award to Alan Kohler. Each fire district also recognized a firefighter by name that individual was the Fire Fighter of the Year from their respective agency. The Higbee Area Fire Protection District named Aaron Rutherford as their Fire Fighter of the Year. Shannon Riddle took home the recognition of being named the Fire Fighter of the Year for the Westran Fire Protection District. The Fire Fighter of the Year for Southeastern Randolph County Fire Protection District was Lafe Stone. Bruce Ferrel received the same honor from the Northeast R-IV Rural Fire Protection District and Ray Haque carried home the honor for the Eastern Randolph County Fire Protection District. The fourth award that was presented that evening was the Board of Directors’ Award. The award was presented to Doug Henry from the Eastern Randolph County Fire Protection District. State Representatives Tim Remole, Caleb Rowden and Chuck Basye each were in attendance to present Resolutions from the Missouri House of Representatives. Representative Rowden presented a special proclamation to Southeastern Randolph County Fire Protection District’s William “Billy” White, who has volunteered since the early 1980’s. He too received a special award from the Fire Marshal’s office. 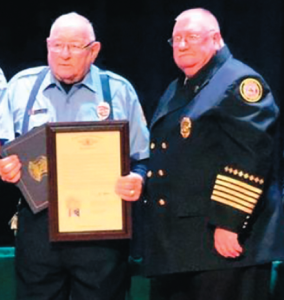 Gerald Wheller of the Higbee Area Fire Protection District was recognized for his 34 years of service as a fire fighter with a proclamation presented by Representative Chuck Basye and a special award from the State of Missouri’s Fire Marshal’s office. David Dodd was called on stage representing the Westran Fire Protection District and received a special proclamation from Representative Tim Remole and a special award from the Fire Marshal’s office for 45 years of service in the Huntsville community and surrounding area. The last award that was presented was to Floyd Watkins of Northeast R-IV Rural Fire Protection District. The proclamation was presented by Representative Tim Remole for Watkins’ 68 years of service as a volunteer dating back to 1948. Fittingly the entire crowd stood to their feet with applause as Watkins was presented his award and a special certificate from the Fire Marshal’s office. “We were very pleased to honor all of these volunteers in our community in this way,” said Chief Harold Muehe of the Northeast R-IV Rural Fire Protection District.